In Luigi's article the adjective becomes grandi poliziotti which is translated by the Daily Mail through either ignorance or malice as 'fabulous'. What idiot would describe the Gestapo as 'fabulous'..
BREAKFAST with Dimitri V. and his family and friends, a noisy gathering of Greek Cypriot fans. I again try to complete the download of the photos sold to me by the American Institute of Physics for our new edition of The Virus House, but this Vodafone connection is too slow and the download is aborted five times. The Premier Inn will refund one night because of the room infestation. You must be exhausted with all the preparations; very proud of way you are handling this. I have lost yet another fountain pen, a very nice Parker, AND my coffee funnel, AND my "Tea" china mug, AND I broke the nice large glass mug I use. She reports: "The online store is currently down, due to an internal server error. Not happy, as over 350 customers were online when it went down." A NOT very good sleep including a long, vivid dream of a forced landing in a 747 somewhere in central Australia, catching up with a TV cameraman who happened to be around, and telling him I am back in Australia, illegally; and then sitting around idly while he -- does nothing. I leave the hotel at nine a.m., set off south for Windsor. Jaenelle has texted from Frankfurt: had a very bad overnight flight -- just off on next leg to Warsaw. I do hope she has no problems entering; she should be okay. At the Costa's coffee shop my Vodafone broadband link is really fast and I download the remaining American Institute of Physics photos in a flash. The Premier Inn will not give me the refund in cash, but will "send a cheque in the next two or three weeks". Good for their cash flow, bad for customer good will. G. has replied: "Blimey! All very cloak and dagger, but this is of no surprise to me! [. . .] I do hope thereafter we have a 'quiet and pleasant trip' as you have indicated. However, being the ever pessimist, I can envisage the 'media' showing up in many of the tour locations; let's hope I am proven wrong?" I just wanted to say how much I enjoyed your company and your talk in Newcastle. [. . .] Although I own all of your books, I purchased new copies of Hitler's War and Göring, together with the DVD 'Victory of Faith', clips of which I have seen in other videos but never the whole film. I have enjoyed comparing your latest edition of Hitler's War with my original copies [. . .] I regret the loss of some elegantly written passages from the Macmillan PaperMac editions. Having finally arrived in Poland, Jaenelle emails: "I'm going to sleep now, so don't bother me. I'm not waking up for anything. The building could be on fire and I wouldn't even care at this point." I hope you are sleeping peacefully. Probably the sleep of the dead. [I shall] do a London talk on Saturday October 2 at 4 pm before leaving for the USA. Wasn't the theme of my talk in the USA a different one this time, roughly: "Hitler's People: The men and women closest to him and the secrets they told me." It will be the theme of the London talk. Can we ask that our Warsaw coach driver understands that it is a non-smoking bus. Poles smoke a lot. Hope I get in with as little trouble as you did. UP at 7:30 a.m. A cold night, and only cold water in the wash basin. Jaenelle reports from Warsaw: "Just off to speak to a few of the hotel people and then to see about a sightseeing bus that our people may enjoy for their last day here, especially if it goes anywhere near the Ghetto or the Warsaw Uprising museum." I spend the morning in Eton. We have leaked to the press that I am already in Kraków, i.e., near Auschwitz. This has produced the desired confusion in the press and enemy ranks. Lucie Beranova of the Czech daily Hospodarske noviny asks if I had any problems arriving to Poland, and if I still plan to visit all the sites and "if you been contacted by Polish authorities in Kraków?" I reply tersely: "No contact yet." At 10:42 a.m she then phones, "Are you in Poland already?" I refer her to Jaenelle, but add at 10:43 a.m to Jaenelle: "Of course they can check my IP and see it is British, so I shall not answer any more by email. I am referring them all to you, swine that I am." I order more painkillers for when I return, as the "prison leg" souvenir of solitary confinement in Vienna has become more troublesome. K. emails: "Re: Seen this? Poland lodges Holocaust denial case." It reports that the Otwarta Rzeczpospolita (Open Republic) organisation is accusing me of committing an offence under Polish law in my book Hitler's War (Macmillan Litd and The Viking Press, 1977), as it "attempts to minimise both Nazi atrocities and Hitler's responsibility, and which was published in Poland last year." I reply: "No, but I don't think they will get very far with it unless they really want to harass me." Hugo emails: "Look forward to seeing you tomorrow. I am travelling disguised as a German but, if quizzed by anyone, will confuse them by telling them I'm Danish (which I am partly)." A very full day. The Daily Telegraph's local man Matthew Day has phoned and I tell him to come at ten a.m. to the breakfast room. He duly turns up, I presume, identifies himself as Finlay, and I talk to him for half an hour wondering why he is not asking any real questions; very laid-back and astute, I presume. Not so. When I mention that we have many guests coming, including one from Australia, Jaenelle says brightly, "And this is he!" Jaw and penny drop simultaneously. He is one of our guests. The real Telegraph man turns up soon after. The media phone all morning. Since Jaenelle has dropped the plan for me to greet guests at the airport, for security reasons, I allow individual media reps to come here, on the undertaking not to identify this hotel in any way (as in fact our contract requires anyway); I give them appointments spaced at hourly intervals. I am filmed by three Polish TV stations, Reuters, and have interviews with Ulrich Kroekel of Die Zeit, Agence France-Presse (with photographer Janek Skarzynski of Getty Images), and Polish newspapers. All goes well. The press is now boiling with juicy and uninformed smears against me. Opponents are demanding that the police arrest me in advance of anything I might say. I say the opponents are "using Nazi tactics" and violence, because the use of the police to suppress opposition views is precisely what the Nazis did. "History does not belong to the Jews," I say to one reporter; and, "The Jews don't own history," I tell another; these sound-bites will go down well with wider audiences. "History belongs to all Humanity." One reporter tells me there is a big demo at the Auschwitz camp today, as my "presence" in Kraków yesterday, widely and authoritatively reported by the Polish Press Agency and media, led people to deduce I was going to that site. Not so. Our guest Milton E. confirms that on TV screens at the airport on arrival an hour or two ago he saw banners and swastikas and flag-waving. Ho! We gather in all our guests and have lost only one -- Bernard B., who phones from the USA to inform Jaenelle that the airline simply cancelled the first leg of his flight, to JFK airport, and can not now get him away for two more days. After three more Polish TV interviews, in the evening we have a small get-together and I brief everybody on plans for the next few days. THE press is becoming wilder, and we anticipate trouble somewhere in the next few days. The AFP communique has more of the usual guff; nastier than The Daily Telegraph. Overnight, the latter has quietly edited out one line which would rather clash with its reference to "Holocaust denial", as K. points out: "When I read this initially last night there was a quote from you -- that there was no doubt that several million people had died in these camps? I think it followed on from the bit about not one hair on their heads being harmed? Looks like that line has been removed from the piece today." To Treblinka. When we arrive we find three suspicious types patrolling the parking lot, who turn out to be radio journalists. Jaenelle deals with them and tells them I am not with the group, as I have a stomach upset -- I ask her not to use such lame excuses again in future -- and there is a vanload of police. I hunker down in the bus for two hours while Jaenelle leads the group to the far end of the Treblinka site, and then we drive over to fetch them all along the very bumpy road. 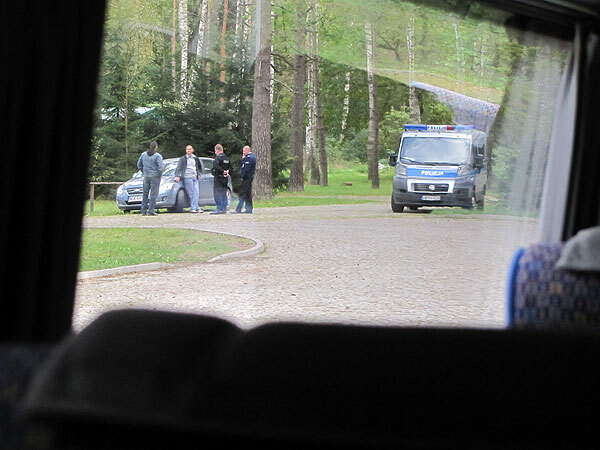 As we leave Treblinka, I step out and go the police van to thank the officers, and say we are going now. IN the bathroom, I take a pain tablet, but then notice that it has come from a pocket of the foil sheet that has seemingly been opened and carefully smoothed back shut. I pause, then spit it out at once, and rinse my mouth out several times. Can't be too careful, as the increasingly violent press attack on me continues. Warsaw's Associated Press correspondent Monika Scislowska comes for a 45-minute interview by agreement during the morning. I feed my lines to her, but she is tough. I keep a tape recorder running throughout. [See AssocPressInterviewMonika 230910.WMA]. The recording lasts nearly 5 minutes, the rest is not taped for some reason. The danger increases that a hostile newspaper will print an invented "quote" by me with the intention of landing me with a criminal charge in this "democratic" country. That is basically what happened in Austria. 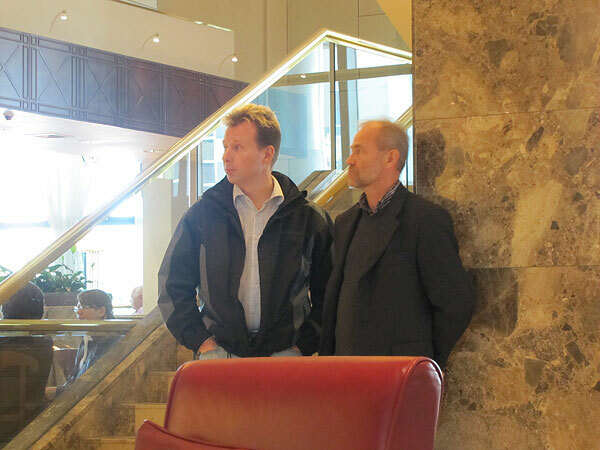 I see two Polish security men standing nonchalantly in the hotel lobby. They look the same the world over. We set out around noon and arrive in Mragowo, formerly Sensburg, at about five-thirty pm after two stops at restaurants. Lovely sunny clear weather, though it is not hot. My phone runs out of credit on the journey, because of a long call back to The Daily Telegraph journalist Matthew Day. I dictate a new press release to Jaenelle. To our concern, despite all our security arrangements there is a photo journalist from the Polish Press Agency already waiting for us on the hotel parking lot; that's nice. I speak on his phone with his boss and agree to photographs being taken, on condition there is no mention of the hotel or town, just "in Masuria". Jaenelle tries to get from them the information on who provided this hotel identity to them, but I tell her she's wasting her time. On reflection, I speculate it is the bus company who alone know -- or think they do -- each day's destination. Tomorrow we will inform the driver wrong therefore. Catching a cold, I think. At 7:30 pm I talk to the group on Himmler and Hitler. I report to London: "All well so far and we are now all in East Prussia; but the press have already identified our hotel here; hope all goes well tomorrow, first HQ." After I finish speaking, around 10 pm, Jaenelle reveals privately that her online scrutiny has established (from Gazeta, posted only very shortly before) that the press now knows we are in Mragowo, and that the Polish police are bringing in reinforcements for tomorrow. That is disconcerting, in fact rather tiresome. Jaenelle tells me that the right wing Stormfront website has posts from idiots suggesting I do this tour for money and to gain publicity; in truth we are making the expected loss on this first year's tour, and I have made no attempt to contact the press before setting out from London last week, quite the contrary. Hey ho. Jaenelle comes to my room for a discussion after the talk, and we agree on certain tactical measures tomorrow, aided by the fact that an Italian journalist, Luigi Ofeddu of Corriere della Sera, has come to Mragowo, eager for an exclusive interview. I check the hotel's labyrinth of corridors for possible emergency exit routes. AT eight a.m. Jaenelle comes, reports no signs of any demo starting yet. Maybe the Polish newspapers got it wrong. No surprises there. Or maybe the opponents are all money and hot air -- "All hat and no ranch," as the Texans say. We have a very thin breakfast with tasteless coffee -- this is quite a Spartan hotel but beautiful and charming with a fantastic view of the lake -- then walk along the lakeshore for half an hour. Later she says that the press have not advanced on yesterday's story, but are adding that we are visiting "many" historic sites in this region today. That's good. I have breakfast at ten with Jaenelle and Luigi Ofeddu the Italian journalist of Corriere della Sera at the Merkure; the coffee here is much better, and I waffle amiably into his tape recorder for an hour. It is difficult to see what is his line. Perhaps he has none. He is quite frank and open, and gives me his card. That being so, we allow him to come along -- in fact for security reasons I go on ahead with him in his car to Heinrich Himmler's bunker headquarters in the forest. He says he has a special interest in Himmler, but I do not inquire what that is. With the usual security precautions we set out around noon. I text an all-clear to Jaenelle to follow with the bus. On the road outside Pozezdrze the little blue sign pointing into the woods, to "Himmler Kwatera Bunker," is new, but that is all. No Disneyland hype here. THE whole area is totally deserted except, curiously, for one elderly Pole standing there in the first clearing (above), in front of the largest bunker, clutching the Polish edition of my book Hitler's War. He explains to me in broken Russian that he has been waiting there all day for several days to meet me, and he has brought the book to get my autograph. I am very touched. 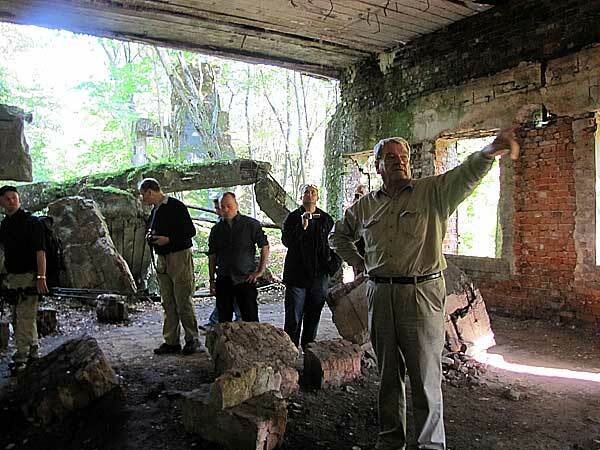 I lecture the group briefly on the significance of this site, and what decisions were taken in these buildings, then invite them all to spread out into the forest for twenty minutes and find the other ruins. We find more than before in consequence -- the Welshman being very good at spotting them among the darker depths of the tall trees. There are no mosquitoes worth mentioning today. The Polish Press Agency photographer who has come separately is delighted with the pictures [which go around the world]. Back outside our group's hotel afterwards Jaenelle spots two television people, a cameraman and a girl. I take pity on them, as they say they are prepared to camp there all night, and send Jaenelle to negotiate restrictions for an interview. They come from Bialystok, three hours' drive away, and are with PFN24; I give the girl, Martina, 27, a jocular interview for fifteen minutes; she does not really know what to ask, and I tease her mercilessly. The cameraman, who appears to have a thing going with her, is not pleased, in fact baffled by it all. Supper is again prodigious and excellent. I take the group into the conference room next door after that and talk to them about Himmler and the evidence of his foreknowledge of the Bomb Plot against Hitler, and how much Speer, Göring, Guderian, and Goebbels may have also known in advance and not told Hitler. There is evidence both ways. Our tour group has moulded into a very friendly unit, with only the Scotsman being a bit stiff because, well, few of us can understand more than ten percent of what he says. [. . .] Jaenelle is such a nice girl, and there is huge praise for her efforts all round. She is commanding and efficient, and acts as though she has been doing this all her life; her only flaw today was to forget to bring the flashlights which I brought from England so we can actually see into the depths of the bunker cavities. I tease her over this. The Polish and world press is still boiling over my little tour, with over five hundred newspaper articles found by Google alone. How very odd. THE high point of the tour comes today, the tour of Hitler's headquarters ruins. Anthony L., our archeologist group-member, is really looking forward to it. Jaenelle says three or four of our guys went for a swim in the lake this morning -- and it must be icy cold. 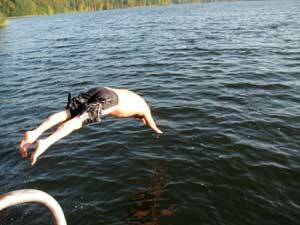 She persuaded them to dive in for the benefit of her camera. What men do for a good-looking blonde. With Luigi Ofeddu the Italian journalist following us exclusively and by our special invitation in his car, we leave the hotel for the Wolf's Lair at ten-thirty a.m., delayed by waiting for the now inevitable straggler -- Finlay the Australian has overslept. As we reach the restaurant on the parking lot, the former SS Leibstandarte canteen, the inevitable happens, a TV journalist has spotted us. I tell Jaenelle that I will speak with them after the tour if they leave us and our guests alone until then. They explain they have camped out at here at Hitler's headquarters for three days to find me, so there is not much we could have done to avoid it. 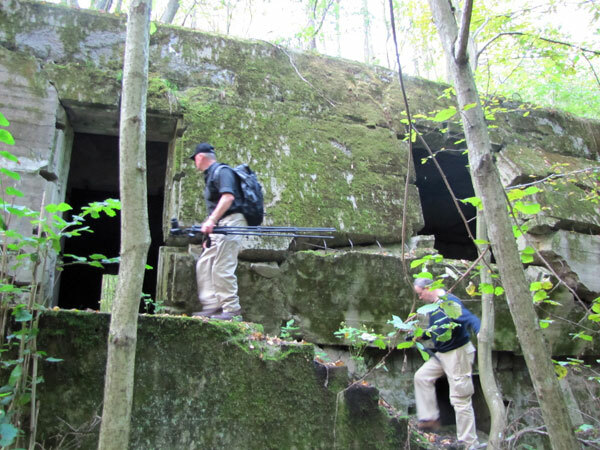 We agree that no guests shall be filmed, but they may shadow me around the headquarters site; I take them on a route which does not go past Block 13, Hitler's bunker. They film on and off for an hour. Channel 24, I think, a local crew. [See my audiotape Rastenburg w TV 24, 250910.WMA, 2 mins 36secs.] After I reach the parking lot, I say "Koniec," and they are content and leave. 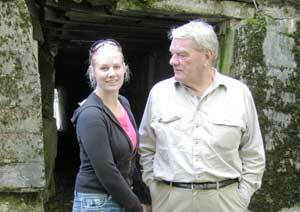 I rejoin Jaenelle, who is with our group behind Martin Bormann's bunkers, and we restart the tour proper. The two Polish security service men stand out like sore thumbs, and many cameras are clicked in their direction. We have a few quite active men amongst us -- Finlay and Harry like climbing up the sixty-five year old iron rungs to the top of buildings, to which I myself would not have entrusted my weight. Graham likes burrowing into the innards of the smaller sites. 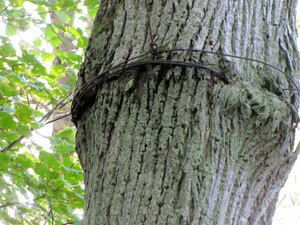 François is the first to spot the wire hooks on the trees (left) -- above Hermann Göring's bunker, tucked away in the furthest corner of the compound -- from which the camouflage netting was suspended. There are again about two thousand people here throughout today, to judge by the vehicles. Back at the parking lot, a large tour group mills past and their short blonde fortyish woman guide spots me, and calls out Good Day in Polish. I respond in kind, and she says with a broad smile, "You are David Irving aren't you?" I nod, and she spends twenty minutes introducing me to her group, which waits patiently, and sharing notes -- displaying her own knowledge of the site. Her card says she is Jadwiga Korowaj. "I have your book on Morell, the Polish edition: The Diaries of Hitler's Doctor", she says. I forgot it had appeared in Polish; perhaps I never knew. She knows Professor Peter Hoffmann (McGill University, Montreal) and many of my other sources. There is so much for my group to see, and they are like small boys at a picnic: for them, this is truly the highlight of the entire tour. 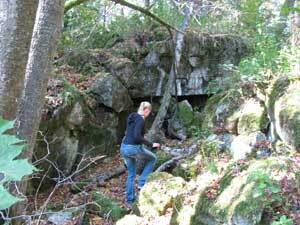 And then Jaenelle, delectable and eager though she is, spoils things by demanding that the group now crosses the main road to inspect Sperrkreis II, south of the road, where Hitler's lesser people had their buildings -- Albert Speer and his ilk. It is already four p.m. and we have been trekking round the forest area for four hours. I opt out; my prison-weakened limbs are protesting, but she insists. They gamely follow after her, taking as it turns out a wrong turning for two miles, and return to the parking lot around five-fifteen p.m., one or two of them pretty disgruntled by this Extratour. I like Jaenelle heaps, but she can be pretty infuriating even without trying. Must have learned it from somebody. I work all evening on The Virus House for the Classic edition. Resetting the book's tables takes some time. In the evening I find a very weird article by Julian Kossoff (left) on The Daily Telegraph website, entitled "Jews have a bigger worry than the vile nutter David Irving: Ahmadinejad's Iran". It contains entirely fictitious interview-elements with myself, and things I am supposed to have said -- all made up. I have never been in Iran, nor attended any conferences there. I am scratching my head with perplexity about this writer. Who is he, this Kossoff? I do not recall ever having met him, and never said those things. Over a small beer with four of the guests later, Graham asks me, "Are you making a loss on this tour?" and I say that as things stand, yes we are, but one expects that the first time round. Inge S. saved our bacon on this one. It depends what we include: the cost of the earlier pilot-visits for instance. NOT a very comfortable bed here, but no matter. Settling up with the hotel, we try various cards at the hotel front desk. Jaenelle's have been blocked by her US bank because they do not trust Polish charges, and phone calls to her bank are fruitless, it being the small hours of a Sunday morning over there. As Jaenelle says this morning, we really need twenty to thirty guests next time to make a clear profit. We set out in the coach from East Prussia back to Warsaw at twelve, stop once for a snack, then again for a coffee break, run into a huge traffic jam north of Serok, and finally get to the hotel and check in around six pm. Corriere della Sera has published Luigi Ofeddu's article; it is not bad, though tendentious in parts and not properly reflecting the careful language I used to him: "Hitler? Un grande uomo» Il viaggio-provocazione di Irving. Il negazionista guida in Polonia un gruppo di nostalgici." He was a very good journalist, polite and open toward us and he kept all the bargains we made with him about confidentiality. Our showing of the film "Downfall" ends at 10:30 pm and Jaenelle summons me downstairs to talk about it. I do so for an hour, then we wander over to the Sports Bar where she snarls at me and I leave with the Belgian François de W. and Henry to the penthouse bar for a chat. Absolutely penniless for the moment now. I work until 1:15 a.m. I LEAVE with Jaenelle and the group at 11:10 a.m., after a Polish Press Agency journalist and his mate ask to tag along; we agree to meet them at Warsaw city's historic Umschlagplatz. "Prison leg" is hurting badly today. Back at the hotel I have a long phone chat with ARD's Warsaw correspondent, a German-speaking Polish woman. She wants to know -- too late -- when we will be in Treblinka, and why we have been so careful to cover our plans and tracks. I explain that the comfort of our guests comes first in every instance. She fritters away nearly a pound of my dwindling phone credit on this chat. I have a coffee and resume work upstairs. I upload page 603 of Uprising to the printers in Tennessee yet again. Damned if I can find any spot-colors in it. Hey ho. The Daily Mail has posted a very garbled version of the Corriere della Sera article, with omissions and excisions of an already tendentious Italian version of our conversation. I now wish I had switched on my digital recorder. I know that Luigi Ofeddu did, i.e. he recorded it on his Blackberry (and without first asking either if he might do so). From London, K. admits: "I am still chuckling over the Gestapo quote." I am not. In fact I described the Gestapo as a "highly professional" police force; and the immediate follow-on in the Daily Mail about Auschwitz and Treblinka is a total violation of what I said, and bowdlerizes even what the Corriere della Sera actually prints. I work more on The Virus House all day. It was a wonderful book, and I had totally forgotten how well it was researched -- nearly fifty years ago -- and reads. We have our farewell dinner at five p.m. Ken T. makes a little speech and proposes a toast to Jaenelle and myself, then Hugo H-T presents the mother-of-pearl brooch to Jaenelle as a gift from all of us for her work on the tour. My cellphone utters a tonk! in the middle of this dinner and Jaenelle reads to me an extraordinary text message from Bente: Jessica is returning to Latymer [...] tomorrow. That is spectacular. Well, getting twelve A-stars in her exams will have been a part of it. I am due to talk at seven p.m. But at 6:47 p.m Jaenelle phones. The Polish Student Association has turned up. Hah! They are not invited, and we move some guests temporarily to my room to security, as it cannot be accessed without a key card for the elevators. A minor kerfuffle as we sort this out, then the talk goes ahead in the appointed second-floor room, with every chair filled including Jan Hunin, Warsaw correspondent of de Volkskrant, Belgium, and Robert Kloczkowski, a friend of Robert Gebert. 7:14 pm Bente asks in a text: "When are you back from Poland?" I am very pleased with the news about Jessica. Jaenelle only now tells me how sad Jessica secretly was about the move to Lady Margaret's and how little homework they set. Two Golden Girls, Jessica and Jaenelle I am very lucky to have them both. I HAVE the clear impression that my laptop was disturbed while I was talking last night. Its lid was slightly ajar (I had concealed it in a drawer). This morning vital "cookies" have gone missing. Jessica texts from London: "Why does it say in the paper that an undercover Italian reporter recorded everything you said and passed it on to Polish secret service? Get out of there!" I reassure her: "He wasn't undercover. He identified himself to us from the start. The Daily Mail has invented most of its story." "This was Metro. What's happening? Are you going to be arrested?" "Unlikely, but who can tell. Running out of phone credit. (Hint). Going for breakfast." The comparison between the stories is indeed extraordinary. I actually said to Luigi Ofeddu, as Jaenelle who was a witness during the whole interview confirms from her own memory, that the Gestapo was a highly professional body. In his article the adjective becomes more simplistically "grandi poliziotti" which is translated by the Daily Mail through either ignorance or malice as "fabulous". What idiot would describe the Gestapo as "fabulous". Matthew Day of the Telegraph asks if he can interview one of our group, and I get him together with François. No idea what they talked about. My US credit card is stone dead, and I cannot find why. Der Tagesspiegel, Germany: Irving reist zu Gedenkstätten in Polen: Foiled Jewish protest organiser whines, "Irvings Programm ist nach offensichtlichen Falschinformationen undurchschaubar geworden"
Associated press: Controversial British writer visits Holocaust site | Russian Jewish leader urges textbook pulled because it "provides the percentage of Jews in former Soviet governments"
Foreign Policy Journal: Do words have to mean something?